Ashish is a post-doctoral fellow in the Institute for Computational Medicine at Johns Hopkins University. He completed a BS in biomedical engineering at Case Western Reserve University (2004) and obtained a PhD in biomedical engineering and MD from Duke University (2011) through the Medical Scientist Training Program. 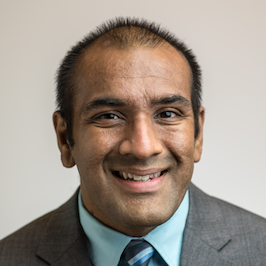 Following graduation, Ashish completed a residency in pediatric medicine at Washington University/Saint Louis Children's Hospital and a fellowship in pediatric cardiology at Children's National Medical Center in Washington, DC. He is board certified in general pediatrics and board eligible in pediatric cardiology. His current work is supported by an American Heart Association Post-doctoral Fellowship Award. Broadly, Ashish's research interests include the application of image analysis, machine learning, and computational modeling to cardiac magnetic resonance imaging in pediatric and congenital heart disease. Specifically, he is interested in arrhythmia risk stratification for children with myocarditis, evaluation of longitudinal physiologic changes in palliated congenital heart disease, and the use of novel parametric mapping techniques in cardiac magnetic resonance imaging (native T1 and T2 mapping). If you have any questions about Ashish's work, feel free to send him an email.